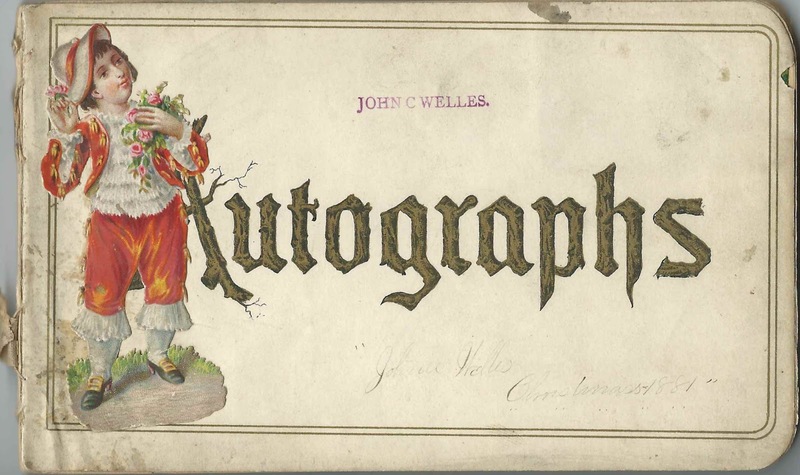 Autograph album with inscriptions from 1881 to 1890 that belonged to John C. Welles of Ortonville, Michigan. The album contains inscriptions from relatives, friends, schoolmates and teachers. In addition to Ortonville, inscribers hailed from other Michigan places: Clarkston, Goodrich, Groveland, Lapeer, Mackinaw City, Oakwood; Saginaw; Standish and Tecumseh. 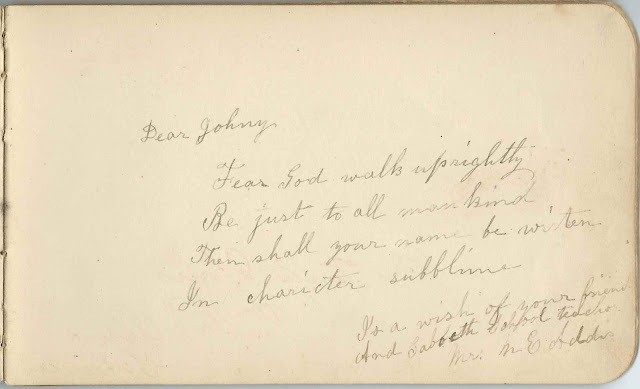 John C. Welles' stamped name appears in two places, on the first end paper and on the title page, shown below, which also has the handwriting: "Johnie Welles, Christmas 1881"
The album measures approximately 6-3/4" by 4-1/4" and contains the sentiments of about 96 of John's relatives, friends, schoolmates at Ortonville High School, and teachers. An alphabetical list of inscribers, together with any personal information they offered, appears at the end of this post. Arnold  H Hummer Rourk ? Bedtelyon Jones T Tait ? D Darling N Nelles or Neller ? John C. Welles was born, according to his gravestone, on November 10, 1870. According to the record of his marriage to his first wife Emma C. LePard, John was born at Ortonville, Michigan, the son of John H. Welles and Fidelia (Eaton) Welles. Sister; inscribed at Christmas in 1881; presumably Mary Fidelia Welles, who inscribed a page later in the album as Mrs. E. D. Lockwood, presumably the wife of Edsil D. Lockwood. Mrs. E. D. Lockwood; inscribed at Ortonville, Michigan, on May 1, 1884. Perhaps Mary Fidelia (Welles) Lockwood, wife of inscriber Edsil D. Lockwood and sister of album owner John C. Welles. Art H. Welles; inscribed at Standish, Michigan, on December 30, 1890. John's cousin. Possibly Arthur H. Welles, son of William Nelson Welles, who was a brother to John's father John H. Welles. George W. Welles; inscribed at Standish, presumably Standish, Michigan, on November 20, 1884. 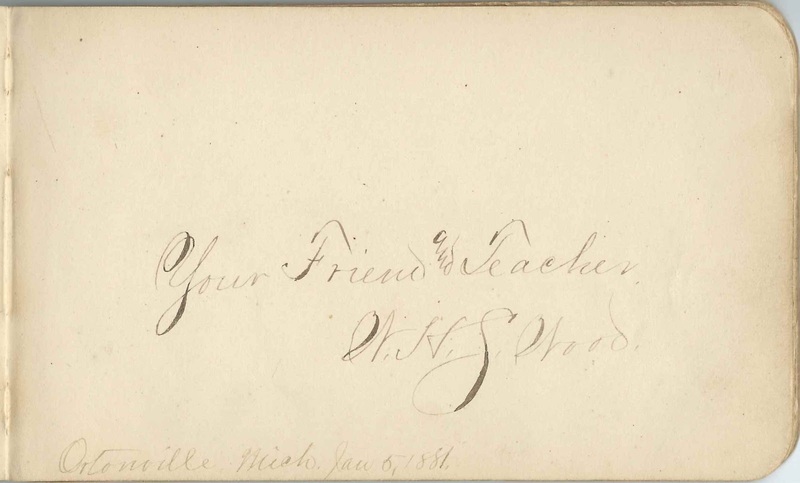 John's cousin, who signed his name as George and stamped the page as Geo. W. Welles. 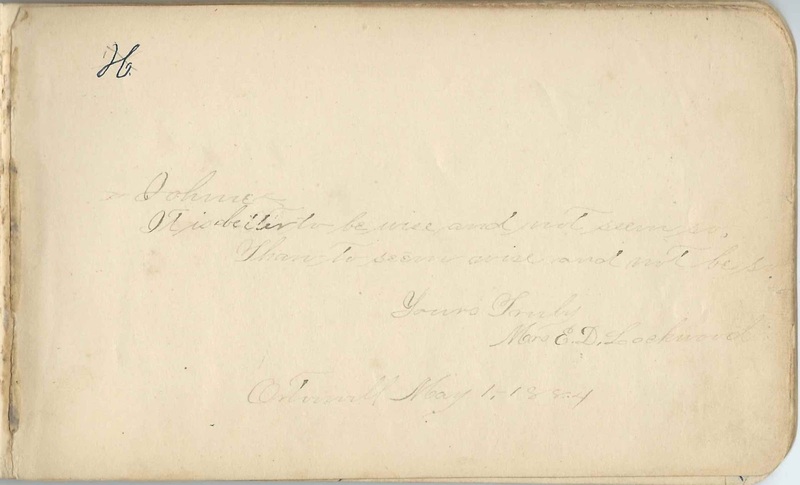 Below, pages inscribed by John's sister Mary Fidelia Welles, before and after her 1883 marriage to Edsil D. Lockwood. Emma C. LePard, daughter of Joseph LePard; married on July 24, 1895 at Ortonville, Michigan. Emma died in 1906. Abbie Lapp, daughter of Francis Lapp and Emma (Buhl) Lapp; married on June 29, 1909 at Flint, Michigan. John died in 1954 and Abbie in 1959; they're buried in the Woodlawn Memorial Cemetery at Clio, Michigan. Emma C. (LePard) Welles is buried in the Ortonville Cemetery at Brandon Gardens, Michigan. W. H. S. Wood; inscribed at Ortonville, Michigan, on January 5, 1881. John's teacher. Presumably William H. S. Wood, who later became a Michigan lawyer. Katie; inscribed at Ortonville, Michigan, on January 3, 1881; written upside down on the page. Grace Addis; inscribed at Ortonville, Michigan, on January 20, 1883. Could she have been the Flora Grace Addis who married inscriber William H. S. Wood in April 1883? Jennie Arnold; inscribed at Groveland, Michigan, on November 26, 1886. In addition to the usual sentiment, she added along the side: "Don't you remember who pushed somebody into the fence"
George Bedtelyon of Goodrich, Michigan; inscribed on October 22, 1883. The words "Seat Mates" straddle this and the left facing page inscribed by Frank Lepard of Ortonville, Michigan. Mrs. E. D. Lockwood; inscribed at Ortonville, Michigan, on May 1, 1884. Perhaps Mary Fidelia (Welles) Lockwood, wife of Edsil D. Lockwood and sister of album owner John C. Welles. Paul Masur; inscribed on February 1, 1886. John's friend and schoolmate. The inscription was written half in English and half in German. A. H. Miller; inscribed at Standish, Michigan, on December 3, 1890. 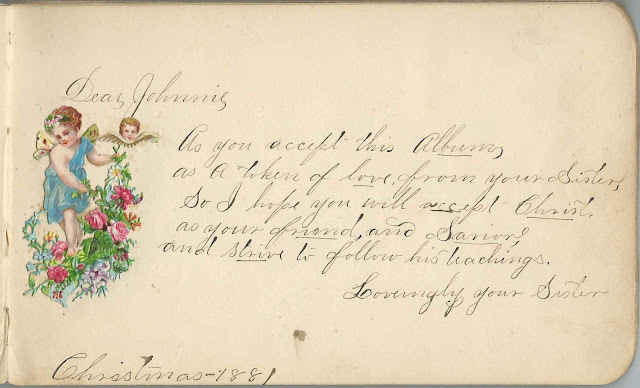 "When far in the northern part of Michigan remember me as a true friend"
John Nelles, or John Neller; or possibly John Welles, and, as such, possibly written by album owner John Welles himself. First letter of surname looks more like an "N", though. Fred O Rourk of Ortonville, Michigan; inscribed on January 24, 1883. 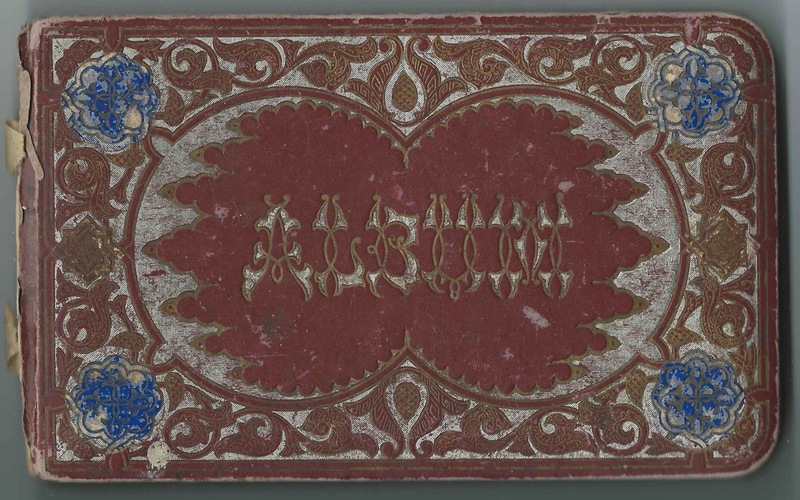 The words "Seat Mates" straddle this page and the left facing page inscribed by James C. Ball.
? M. Tait;, not sure of surname; inscribed at Ortonville, Michigan, on February 9, 1883. The words "Seat mates" straddle this and the left facing page inscribed by Jennie Leece. Art H. Welles; inscribed at Standish, Michigan, on December 30, 1890. John's cousin. Possibly Arthur H. Welles, son of William Nelson Welles, who was a brother to John's father John Holdridge Welles. John C. Welles of Ortonville, Michigan, album owner. His stamped name appears on the first end paper and on the title page, which also contains handwriting: "Johnie Welles, Christmas 1881"
Frank Wolfe of Ortonville, Michigan; inscribed on November 22, 1882 "At School"
W. H. S. Wood; inscribed at Ortonville, Michigan, on January 5, 1881. John's teacher William H. S. Wood who became a lawyer and who married Flora Grace Addis. Could she have been inscriber Grace Addis?